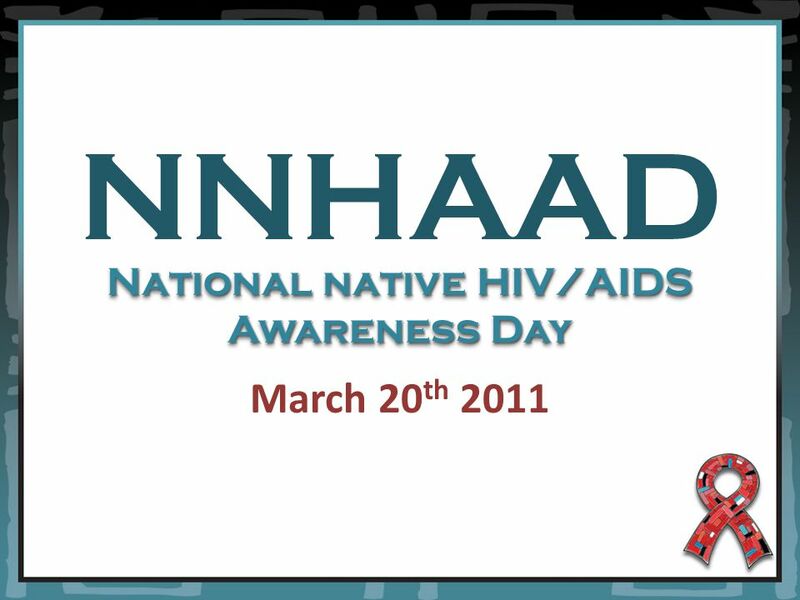 NNHAAD March 20 th 2011 National native HIV/AIDS Awareness Day. 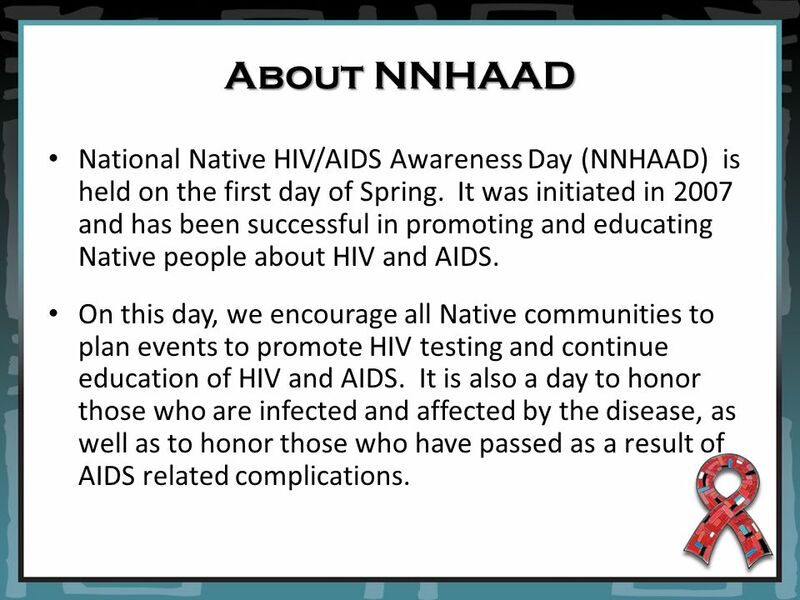 3 About NNHAAD National Native HIV/AIDS Awareness Day (NNHAAD) is held on the first day of Spring. 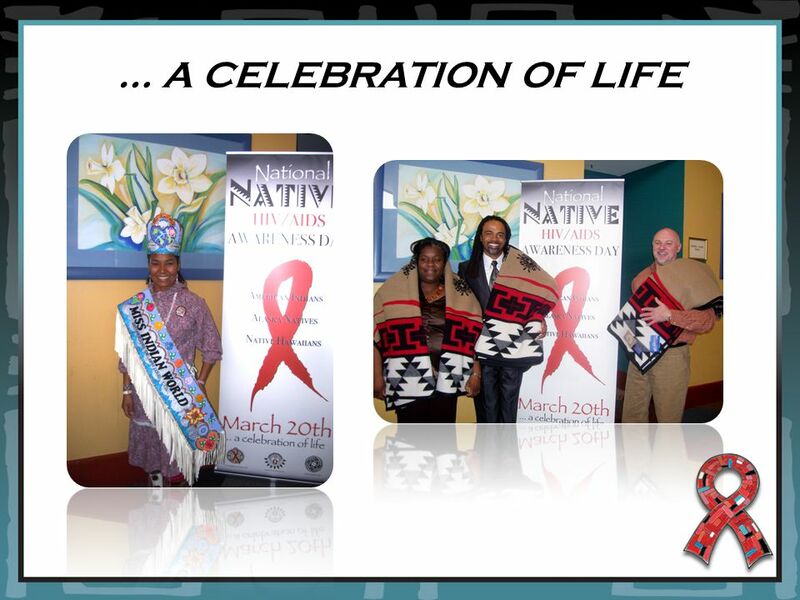 It was initiated in 2007 and has been successful in promoting and educating Native people about HIV and AIDS. 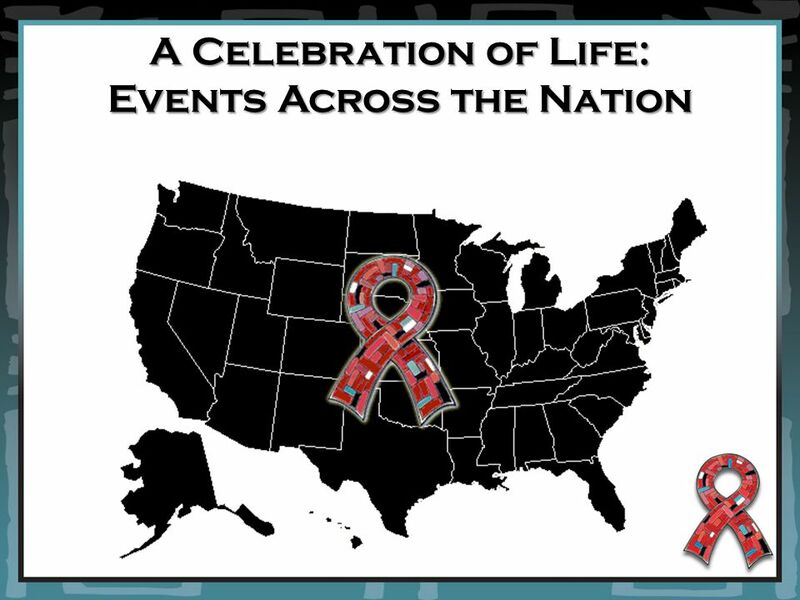 On this day, we encourage all Native communities to plan events to promote HIV testing and continue education of HIV and AIDS. 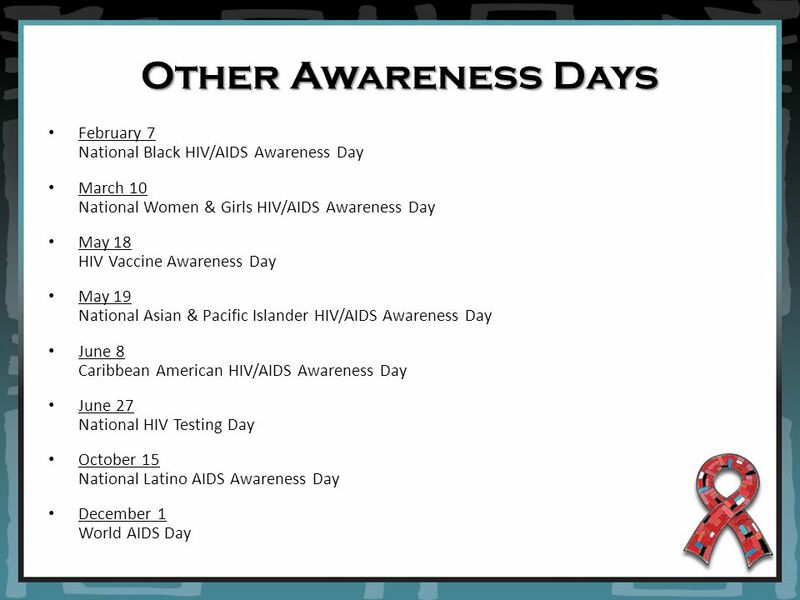 It is also a day to honor those who are infected and affected by the disease, as well as to honor those who have passed as a result of AIDS related complications. 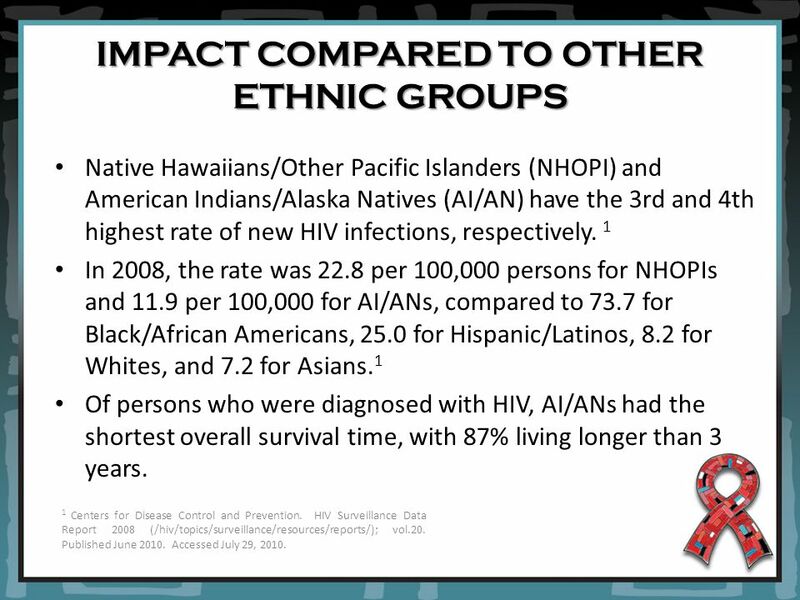 5 IMPACT COMPARED TO OTHER ETHNIC GROUPS Native Hawaiians/Other Pacific Islanders (NHOPI) and American Indians/Alaska Natives (AI/AN) have the 3rd and 4th highest rate of new HIV infections, respectively. 1 In 2008, the rate was 22.8 per 100,000 persons for NHOPIs and 11.9 per 100,000 for AI/ANs, compared to 73.7 for Black/African Americans, 25.0 for Hispanic/Latinos, 8.2 for Whites, and 7.2 for Asians. 1 Of persons who were diagnosed with HIV, AI/ANs had the shortest overall survival time, with 87% living longer than 3 years. 1 Centers for Disease Control and Prevention. HIV Surveillance Data Report 2008 (/hiv/topics/surveillance/resources/reports/); vol.20. Published June 2010. Accessed July 29, 2010. 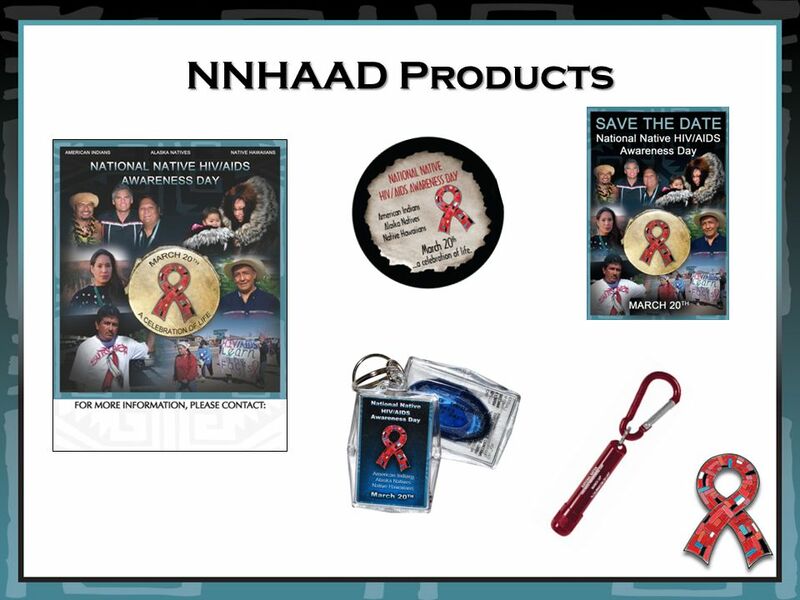 6 NNHAAD Facts: HIV/AIDS AMONG AMERICAN INDIANS AND ALASKA NATIVES POPULATIONS Since the beginning of the epidemic through 2008, 3,629 American Indians/Alaska Natives (AI/AN) have been diagnosed with AIDS. 1 1,847 AI/ANs with HIV/AIDS have passed away. 1 In 2008, there were an estimated 2,306 AI/ANs living with HIV/AIDS – 1,650 men, 627 women and 29 children. 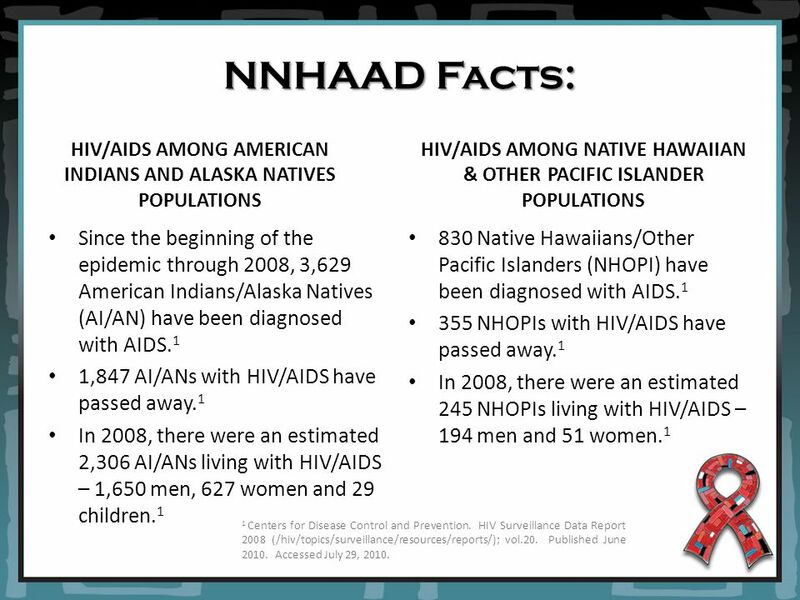 1 HIV/AIDS AMONG NATIVE HAWAIIAN & OTHER PACIFIC ISLANDER POPULATIONS 830 Native Hawaiians/Other Pacific Islanders (NHOPI) have been diagnosed with AIDS. 1 355 NHOPIs with HIV/AIDS have passed away. 1 In 2008, there were an estimated 245 NHOPIs living with HIV/AIDS – 194 men and 51 women. 1 1 Centers for Disease Control and Prevention. HIV Surveillance Data Report 2008 (/hiv/topics/surveillance/resources/reports/); vol.20. Published June 2010. Accessed July 29, 2010. 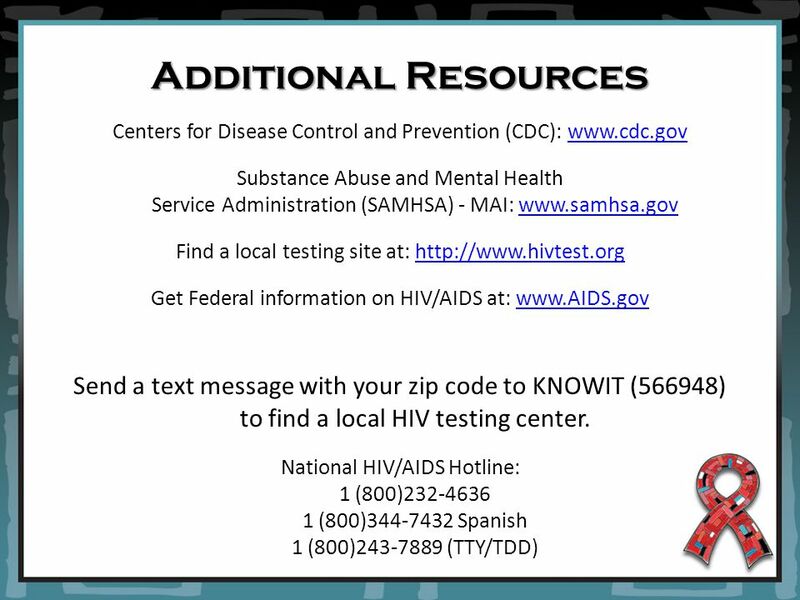 7 Number of New HIV and AIDS Diagnoses Annually Centers for Disease Control and Prevention. HIV Surveillance Data Report 2008 (/hiv/topics/surveillance/resources/reports/); vol.20. Published June 2010. Accessed July 29, 2010. 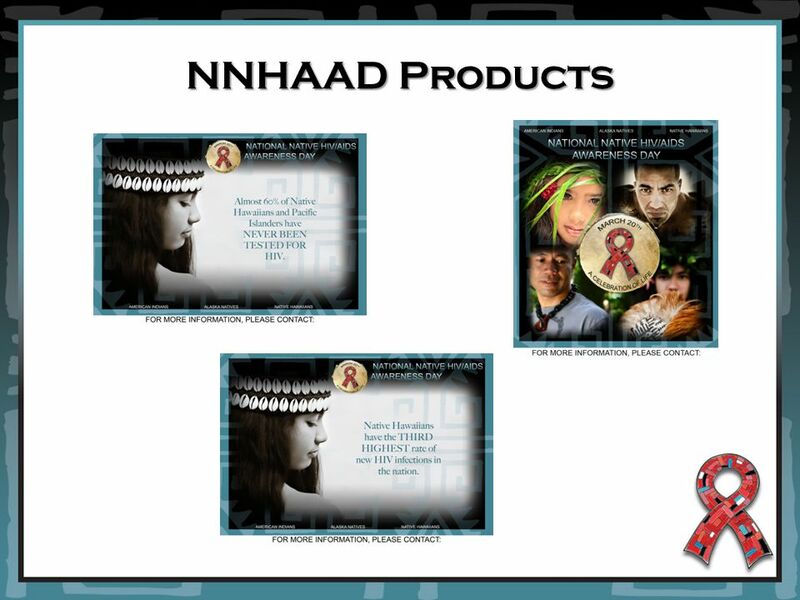 8 HIV/AIDS AMONG NATIVE CHILDREN Since 2005, there have only been 3 American Indian/Alaska Native children under the age of 13 diagnosed with HIV. 1 Since 2005, there has not been any Native Hawaiian or Other Pacific Island child diagnosed with HIV. 1 Between 2005 and 2008, there was not been a single AIDS diagnosis among a Native child under the age of 13 years of age. 1 Centers for Disease Control and Prevention. HIV Surveillance Data Report 2008 (/hiv/topics/surveillance/resources/reports/); vol.20. Published June 2010. Accessed July 29, 2010. 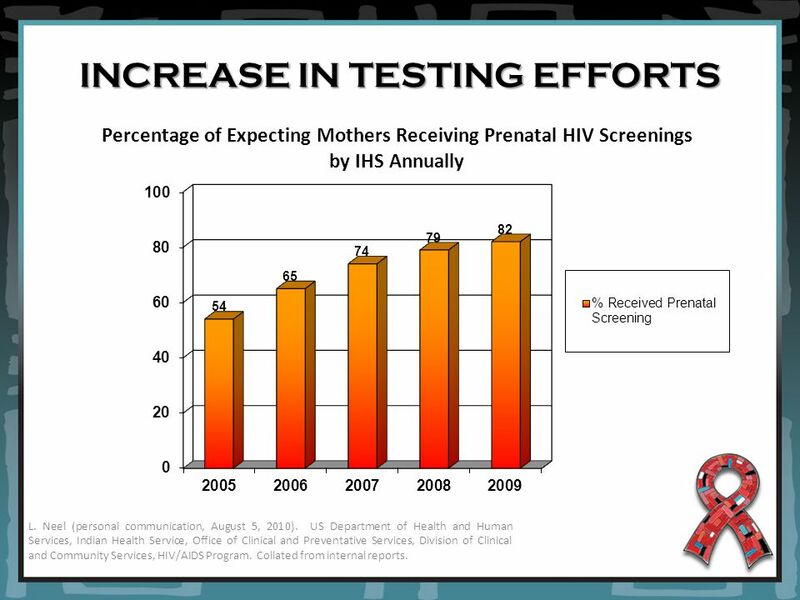 9 INCREASE IN TESTING EFFORTS Percentage of Expecting Mothers Receiving Prenatal HIV Screenings by IHS Annually L. Neel (personal communication, August 5, 2010). US Department of Health and Human Services, Indian Health Service, Office of Clinical and Preventative Services, Division of Clinical and Community Services, HIV/AIDS Program. Collated from internal reports. 10 INCREASE IN TESTING EFFORTS Number of HIV Tests Conducted by IHS by GPRA Year (2008 numbers inclusive of MAI funded tests) CDCs latest surveillance report contains data from 2008 and only from 37 states. Actual numbers may be much higher as some state3s excluded from the report contain large populations of AI/ANs and NHOPIs (i.e., California, Washington, Oregon, Hawaii, and Montana). 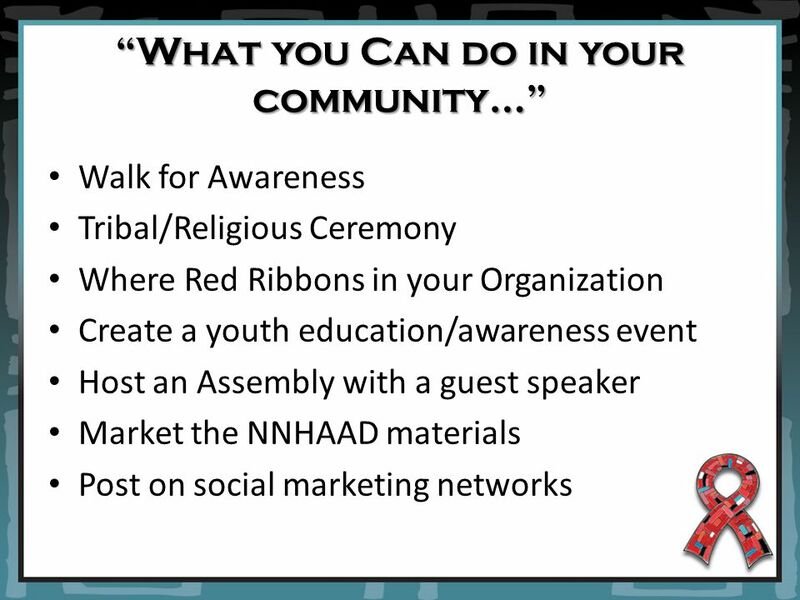 Download ppt "NNHAAD March 20 th 2011 National native HIV/AIDS Awareness Day." 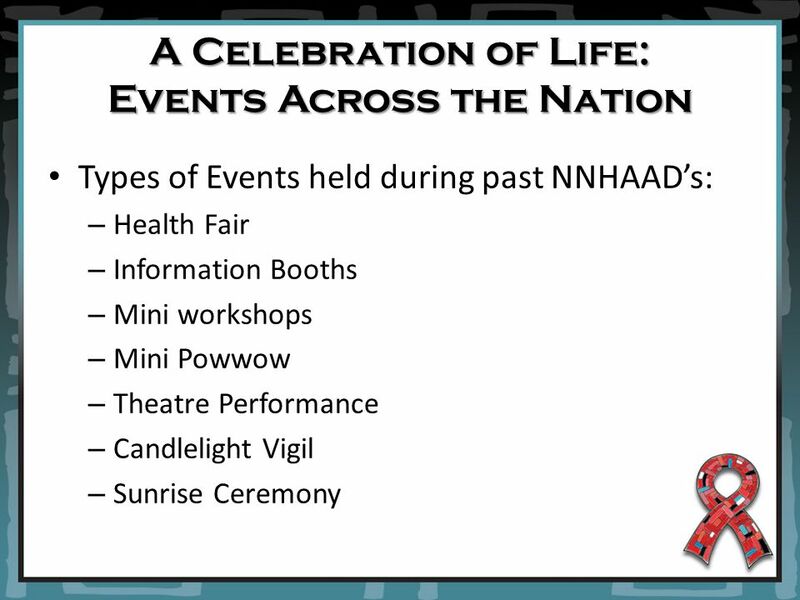 NNHAAD March 20 th 2010 National native HIV/AIDS Awareness Day. STDs & HIV in Indian Country Lori de Ravello, MPH CDC assignee to the Indian Health Service June 14, 2007. Wisconsin HIV/AIDS Surveillance Annual Review: Slide Set New diagnoses, prevalent cases, and deaths through December 2014 April 2015 P Wisconsin. National Center for HIV/AIDS, Viral Hepatitis, STD & TB Prevention Division of HIV/AIDS Prevention Epidemiology of HIV Infection through 2012. HIV Surveillance by Race/Ethnicity National Center for HIV/AIDS, Viral Hepatitis, STD & TB Prevention Division of HIV/AIDS Prevention. Sexually Transmitted Disease Surveillance 2013 Division of STD Prevention. Assignment for April 1, 2008 In class We will watch a Bill Moyers’ documentary, Children in America’s Schools. HIV Mortality in Florida 2012 Florida Department of Health HIV/AIDS and Hepatitis Section Division of Disease Control and Health Protection Death data. 2013 Update Illustrating HIV/AIDS in the United States New York, NY. Illustrating HIV/AIDS in the United States 2014 Update New York City, NY. 2013 Update Illustrating HIV/AIDS in the United States Philadelphia, PA.
Maps Based on Data from 2013 HIV Surveillance Report (through 2013) National Center for HIV/AIDS, Viral Hepatitis, STD & TB Prevention Division of HIV/AIDS. 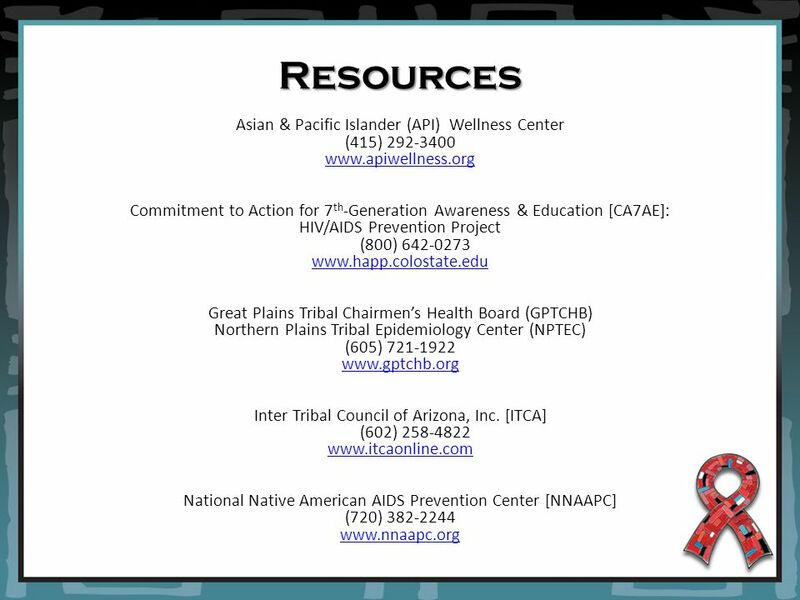 Four Corners TB & HIV Conference National Native American AIDS Prevention Center October 24, 2012 Social Marketing in Native Communities. Epidemiology of HIV among Asians & Pacific Islanders Reported in Florida, Through 2012 Florida Department of Health HIV/AIDS and Hepatitis Section Annual. Epidemiology of HIV Among Asians and Pacific Islanders Reported in Florida, Through 2014 Florida Department of Health HIV/AIDS Section Division of Disease. Impact of HIV Disease, Among the Caribbean-Born, Reported in Florida, Through 2013 Florida Department of Health HIV/AIDS Section Division of Disease Control. Epidemiology of HIV Among Men in Florida, Reported through 2014 Florida Department of Health HIV/AIDS Section Division of Disease Control and Health Protection.